Whereever possible keep power boards up off the floor (in case of flooding, spillage) Putting inside the TV cabinet where A HAND WILL NOT GO AROUND AND ACCIDENTLY TOUCH IS IDEAL. 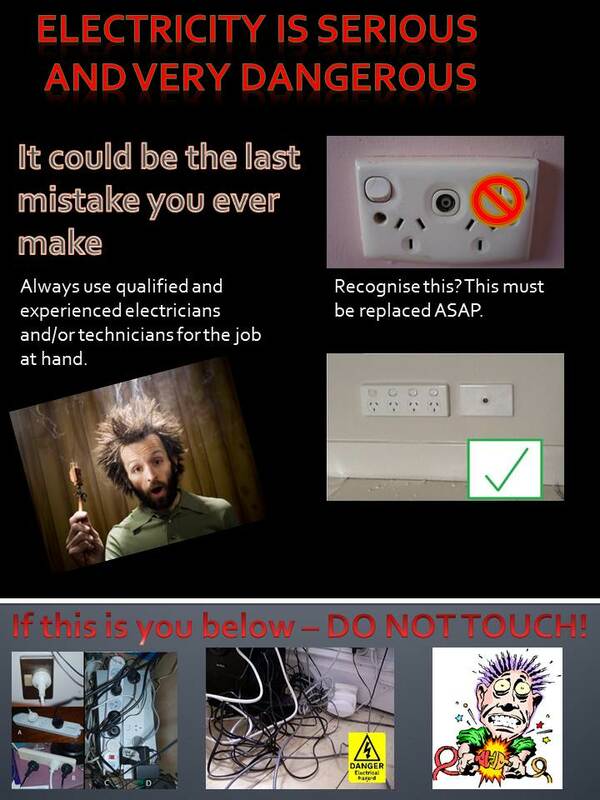 Always use a licenced electrician for Power points, GPO's and electrical work. Always use a licenced technician (TV Magic) for LV (Low voltage) Coax, phone points and home theatre setup. Wrapping and tidying lots of cables together is not advised for picture and audio performances only. There is no preference for tidying cables together in the interest of safety, so here you may do as you wish. Using well insulated, high quality cables will ensure sufficient shielding from the power cables won't interfere with your HD picture and sound etc. Electricity is dangerous. It can kill you. You cannot see it and if in doubt use qualified and experienced technicians for the job at hand. Such tradesman are working with and around these environments every day. They are paid for what they do and are paid to possess the correct attitude and etiquette for working with, in and around electrical hazards. Where you may think you have isolated all the risks, making one wrong move because this is not your day job could cost you your life! Imagine getting stuck, you lose concentration for one moment whilst you're trying to figure something out, the consequences are worse than changing lanes on the freeway without indicating (the car can protect you!) Electricity is invisible and as far as you need to know 100% fatal ALL THE TIME. Is the correct attitude to have if you're thinking of doing electrical work yourself. Don't RISK IT. Always CALL a licenced electrician. Do you need a combination of Phone Points, TV Points, POWER points installed, relocated or moved? TV Magic are licenced, experienced and qualified to install TV points and phone points inside the Network Boundary. We have formed valuable relationships with qualified and preferred electricians for different areas for electrical work. We work with one another to give you what you need to have done in a safe and efficient manner. Contact us with your requirements and we will organise everything so you do not need to lift a finger.